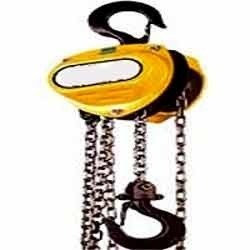 We are among the prominent providers in the industry, engaged in offering Chain Pulley Block to the patrons. The presented block is manufactured by our trained professionals using finest quality essential components and superior technology. Moreover, offered block is also checked on different quality parameters by our experts to assure its durability. Our patrons can avail this block from us in various specifications given by them at most affordable rates. Established in the year 1991, at Chennai, (Tamil Nadu, India), we Industrial Marine Traders are a leading name, engaged in the industry as the manufacturer, retailer, supplier, exporter, wholesaler, trader and distributor of a quality assortment of products like Metal Chain, Lifting Equipment, Metal Fastener, Lifting Rope, Metal Handling Equipment, Gear Coupling, Lifting Pulley, Roller Chain Sprocket, Lifting Sling, Stainless Steel Hook and various others. We are a sole proprietorship firm which is backed by a team of knowledgeable professionals and highly developed infrastructure. The products that we offer are well known in the market for their attributes like perfect finishing, high level of durability, great tensile strength, sturdy construction and cost effective prices. We also offer these products with customized options to achieve highest levels of customer satisfaction.